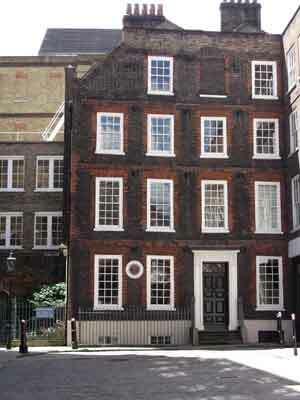 Visiting Dr Samuel Johnson's House allows you a vivid glimpse into the cultural life of eighteenth century London. You can stand in the actual garret where Johnson wrote his famous Dictionary and soak up the atmosphere in this beautiful Georgian building. Learn about the many and various colorful characters that were frequent visitors here, from actresses and artists, to politicians and preachers and many other scholars, writers and intellectuals. As you explore the authentic Georgian interiors and artifacts, you can imagine the constant activity, the exchange of conversation and no doubt the many heated arguments and debates that must have raged here! This three hundred year old house is where Dr Samuel Johnson lived and wrote his famous 'Dictionary of the English Language' which was finally published in 1755. After Samuel Johnson moved out, the building was put to various uses including a hotel, a printer's workshop and a warehouse. Lengthy periods of disrepair and damage followed until it was saved, restored and established as a museum in the early 20th century. Rather than trying to be a recreation of how the house would have looked in Samuel Johnson's time, the museum instead displays objects, paintings, books, furniture and other artefacts relevant to the great writer in order to tell his story. You can explore this unique collection over the entire five floors of the house and this small, independent museum also runs a vibrant programme of activities and events. 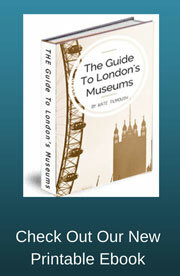 The museum is situated within a quiet courtyard hidden among the backstreets and alleyways behind bustling Fleet Street. It's a tranquil place and another reminder of how London is full of surprises that will reward those who take the time to explore its hidden corners and byways. Our visit to Dr Johnson's House was part of a fine day out in the area where we also took in the famous Wren church of St Brides and the nearby Twinings Tea Shop and Museum. 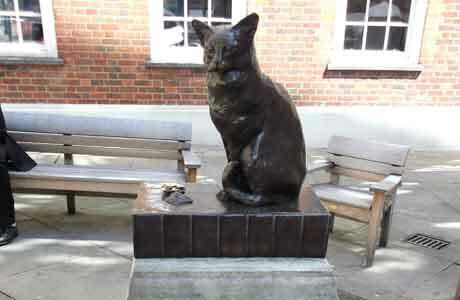 The first confirmation we had that we had found the right place was on seeing the delightful statue of Johnson's pet cat 'Hodge' which faces the house from the other end of Gough Square. The house itself looks beautiful, an increasingly rare survival of tall eighteenth century London townhouses. Once inside you are immediately struck by the atmosphere of the place which is aided by the rooms being painted in a beautiful range of historically authentic colours. Each room has useful laminated information cards that help explain the various paintings, furniture and objects on display. The first room you enter is the parlour in which one of the highlights is the portrait of Johnson's Jamaican servant Francis Barber. Johnson was apparently vehemently anti-slavery and paid for Barber's education and even went on to leave him the bulk of his estate in his will. Walking up the stairs, the next floor opens out into two delightfully light filled rooms with tall windows and panelled walls painted in white and pale green. The floor is divided into two by a curious arrangement of folding partitioned wall panels. One of the rooms is dedicated to Johnson's wife and his many female acquaintances, friends, intellectuals and artists and contains the only known portrait of his wife Elizabeth. 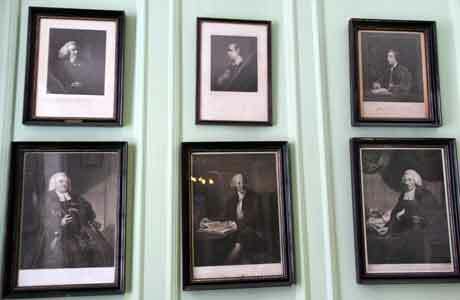 The other room is lined with portraits of many of his male friends, with many of the prints being by the famous artist Joshua Reynolds. One of the simple pleasures the museum offers is provided by its inviting window seats. Here you can rest a while and look out over Gough square and watch the city workers coming and going, or tourists taking souvenir photographs of Hodge the cat. Further up again to another floor and you come to the museum library, this time painted in a pleasingly subtle mustard yellow. This room was apparently originally Johnson's bedroom. It is now lined with glazed display cabinets containing the museum's unique collection of antique books related to (but not necessarily originally owned by) Dr Johnson. The other room on this floor is the will room. Here you will find Dr Johnson's will where he leaves most of his estate to his faithful servant. Finally you climb up to the garret which is the actual room where Dr Johnson organised and created his famous dictionary. Display cabinets explain the processes he employed in order to be able to achieve such an enormous undertaking. With so little remaining of actual objects owned by Johnson, you have to use your imagination to visualise the team of assistants busily working away and the flurry of activity that must have characterised this house. It is a pleasure to feel that you are standing in this place of history, and to read the guest book signed by countless visitors who have come here from all over the world as if on pilgrimage.